The family of WHITE claimed to derive its descent from a brother of the Rt Rev John White, Bishop of Winchester, in 1557. The immediate ancestor of this noble family came to Ireland during the English civil war which commenced in 1641. Margaret, m Richard, Viscount Longueville. 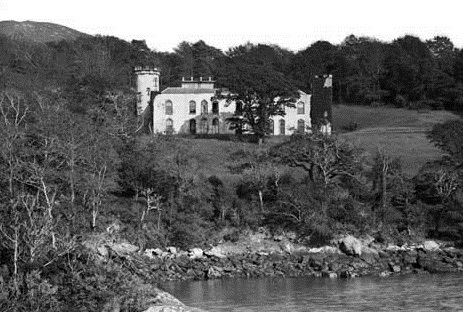 GLENGARRIFF CASTLE, County Cork, is a partially castellated house overlooking Glengarriff harbour. It has a long, two-storey range with shallow, curved bows and ogee-headed windows. At one end there is a square tower; the other end having a considerably loftier, battlemented round tower. The round tower joins the main block to a battlemented wing at an obtuse angle to its end. The Castle was built in the 1790s by Colonel Simon White, brother of the 1st Earl of Bantry. It was built in the Gothic style, with a panoramic view of Glengarriff Bay. The woodlands of the estate encompass a wide variety of trees including Oak, Beech, Japanese Red Cedar, European Larch, Chilean Pine and a variety of shrub and flora species. Wildlife to be seen include red squirrel, sika deer, seals, fox and pine marten. Over the years, Glengarriff has extended hospitality to royalty, artists and writers, such as Thackeray, Synge and Yeats; and, when living in the area, George Bernard Shaw is said to have written his play St Joan here. The actress Maureen O'Hara, who starred with John Wayne in The Quiet Man, for many years kept a holiday home adjacent to Glengarriff Castle. 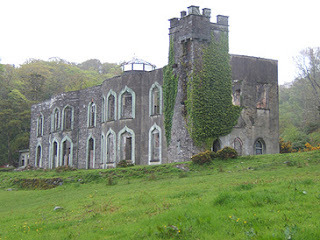 The castle operated as a resort until the late 1970s, but has since become derelict.